Z-Man Games is announcing a new season of their competitive Pandemic tournament, called Pandemic Survival. In the 2018 season, teams of two will play a game that is identical to their opponents’ games. They will have to play with the same roles, infected cities, and the same player cards set up in the same order. Teams will need to efficiently work together to try to find the cure for all four diseases, while also trying to stay ahead of the other teams. And you’ll only have a little more than a minute to complete each turn. May the best teamwork and strategy win! 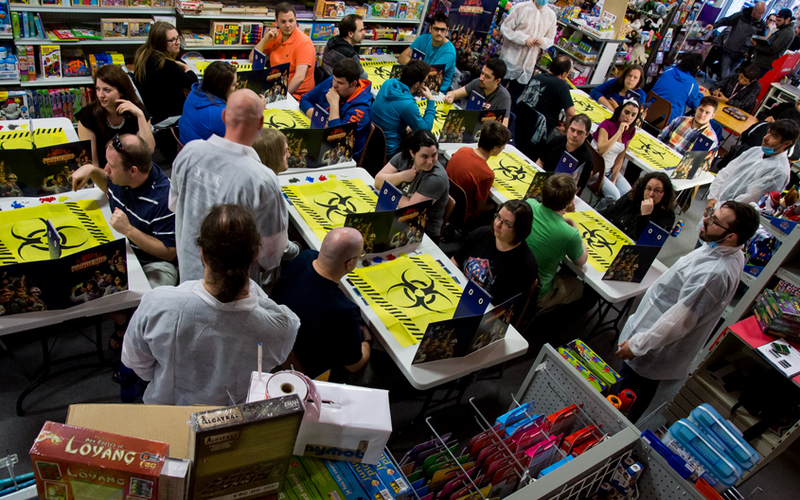 In order to try to compete in the Pandemic Survival World Championships, you’ll need to quality at the Regional level and then compete in your National Championship. If you make it all the way to the World Championships, you won’t have to worry about saving up money to get there. Your airfare and accommodations will be fully covered. The winner of the Pandemic Survival World Championships will receive their choice of trip to any city labeled on the Pandemic board. Besides official Pandemic Survival competitive events, there are also discovery tournaments, where you can test out your skills and decide if you want to take your game to the next level. So far there are no scheduled discovery tournaments or regional qualifying tournaments listed. If you have a friendly local game store, you can ask them to host a discovery tournament. As we get closer to 2018, Z-Man Games will be updating their events page to show scheduled tournaments.